This product is mainly used in refrigeration air-conditioning, cold storage equipment and automatically controls the fluid to pass or not. It is designed by sections and multitude sealed, which has improved the efficiency of opening, the valve body is of SAE connection plus with solder sealing, which eliminates the problem of traditional, problem of inner leakage. 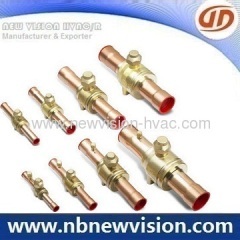 Brass Refrigeration Ball Valve REFBV1/2"
Refrigeration ball valve is mainly used in refrigeration air-conditioning, cold storage equipment and automatically controls the fluid to pass or not. Ball Valve for Refrigeration REFBV3 1/8"
Group of Refrigeration Ball Valve has been presented above, want more	Refrigeration Ball Valve and Brass Ball Valve, Please Contact Us.